With the Ixir 2 Amp High-Power Wall Charger, your Samsung Galaxy or other USB compatible smartphone will always be fully charged and ready to go. With that feature built-in at up to 75% faster rate. 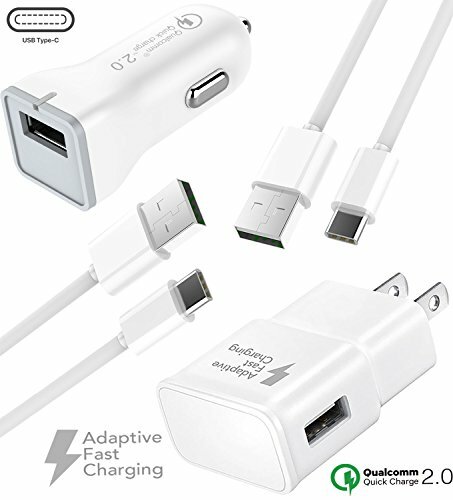 This Type-C 2.0 speed cable for devices connects your phone to your computer for charging and data syncing. Compatible with both the Adaptive Fast Charging wall and car chargers and with just a regular charging device delivering a 2 Amp charging rate. Note 8, Galaxy S8 LG G5, BlackBerry Keyone, HTC U Ultra ,HTC U, LG ,G6Microsoft Surface Phone , Galaxy Xiaomi , Mi7 Galaxy note, Google Pixel 2 , OnePlus 5: 20 Honor 9Samsung Galaxy J3 & J5 (2017): Nokia 9 ,One plus 3t ,HTC 10, Google Pixel, Google Pixel XL, Apple: MacBook (12-inch), Google: Chromebook Pixel (2015), OnePlus 2, Nexus 5X, Nexus 6P, Motorola: G4, G Flex 2, V10 Nokia: N1 tablet, Lumia 950, Lumia 950XL, Asus: Zen AiO, ZenPad S 8.0 Lenovo: Zuk Z1, HP: Pavilion X2, and other devices with USB Connector. If your device does not feature this technology, it will charge at normal speed without a hitch. Works with Quick Charger compatible devices Sync and transfer files via Type-C data cable. ✔★• LIFETIME REPLACEMENT WARRANTY •★• SUPPORT AND MORE---: IXIR offers a no-hassle money-back guarantee for a full 30 days. After that, we offer a lifetime return-and-replace warranty for manufacturer defects. Please contact our Customer Service in order to get a replacement or a refund. Warranty non-transferable to unauthorized re-sellers! ✔ ★Type-C to USB CHARGING KIT ---: The Ixir Combo Charger Set includes 1X Wall Charger, 1x Car Charger and 2x USB to Type-C to USB cables, Ixir Combo Charger set Charges all other non-fast devices will charge USB 2.0 phones and tablets that use Micro-USB at their normal speed. Syncs and transfers files via Type-C to USB data cable. ✔ ★*UNIVERSAL CHARGING ***** Ixir Combo Charger set Charges all other non-fast devices will charge USB 2.0 phones and tablets that use Type-C to USB at their normal speed. Syncs and transfers files via Type-C to USB data cable. If you have any questions about this product by Ixir, contact us by completing and submitting the form below. If you are looking for a specif part number, please include it with your message.